BEREA, Ohio (AP) — Baker Mayfield has become the NFL’s unwanted poster boy for helmet-to-helmet hits. 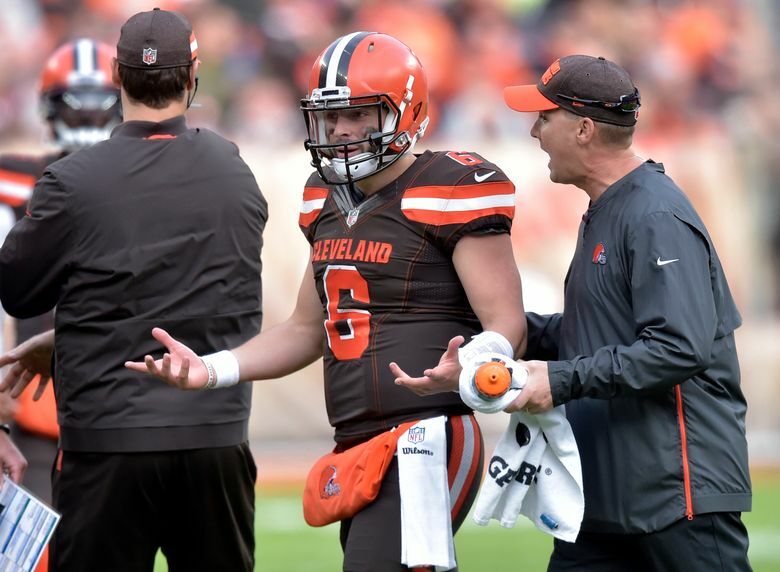 Twice this season, Cleveland’s rookie quarterback has been struck in the head by tacklers during games and both times the officials failed to call a penalty for the obvious infractions. Mayfield’s trying not to take oversights personally. On Oct. 21 at Tampa Bay, Mayfield slid after a 35-yard run and was drilled from the side by Buccaneers safety Jordan Whitehead, who wasn’t flagged but was fined $26,739 fine by the NFL, which acknowledged days after the hit that it should have been a penalty. Last week, Kansas City safety Ron Parker delivered a glancing blow with his helmet to Mayfield while the quarterback was being wrapped up by defensive tackle Chris Jones. Again, no penalty was called, but Mayfield was forced to leave the game after an independent medical observer called the officials and requested the QB undergo a concussion evaluation. Mayfield passed the test and was allowed to return three plays later. He fought to stay in the game. Parker could be fined by the league, which announces its weekly punishments on Saturday. Mayfield, the No. 1 overall pick in this year’s draft, joked that Parker’s hit fortunately didn’t do any damage. Mayfield has sympathy for the officials, who are doing what they can to protect players — especially quarterbacks — while presiding over a game that’s moving very fast. Mayfield smiled when asked if the officiating was as uneven when he played in college at Oklahoma.